TarHeel Corporation was founded as TarHeel Roofing in 1981. Headquartered in St. Petersburg, Florida, the company specializes in commercial work including roofing, waterproofing, cladding, damp proofing, exterior renovations, lightning protection and sheet metal. According to John Looney, president and owner of TarHeel Corporation, the company’s name was changed to better reflect its ability to work on the entire building envelope, including above- and below-grade waterproofing. 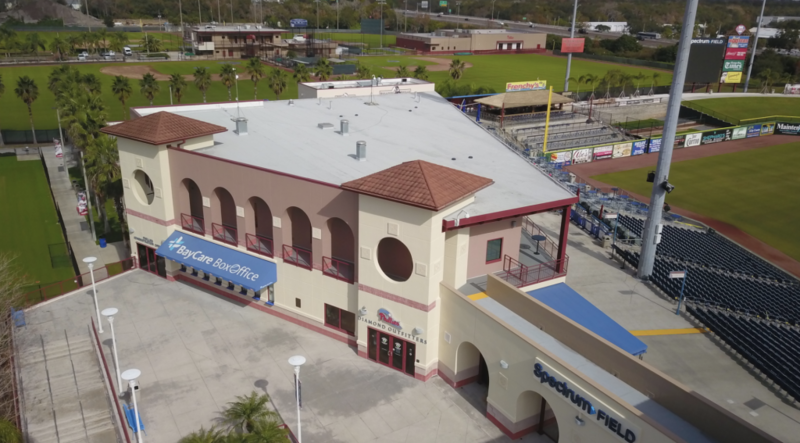 When nearby Spectrum Field needed roofing and waterproofing work, Looney saw the project as a perfect opportunity to show off the company’s versatility. 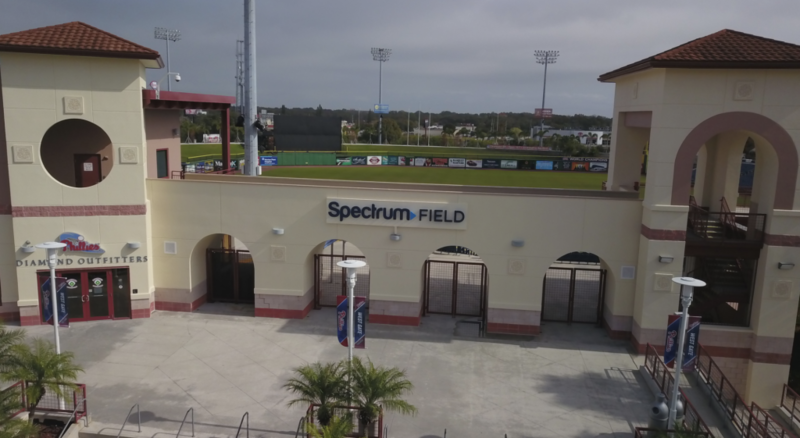 The stadium is home to the Philadelphia Phillies during spring training, and it also serves as the home field for the team’s minor league affiliate, the Clearwater Threshers. “We’ve done a lot of sports complexes in the past,” notes Looney. TarHeel Roofing restored the roof two years ago, and this year the company waterproofed the walls. The scopes of work included cold-applied roofing, waterproofing, caulking, and glazing, as well as repairing the tie-ins to pedestrian deck areas. “There were a lot of little pieces here that were right in our wheelhouse,” Looney says. 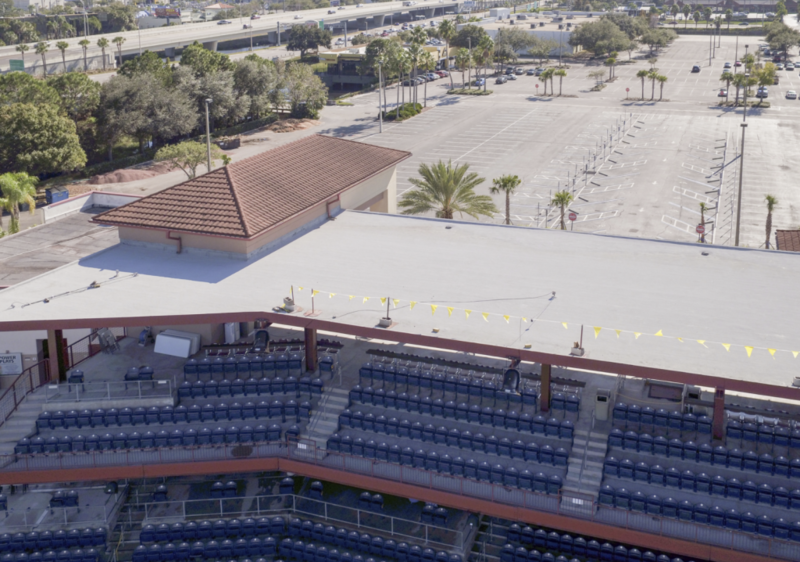 When the stadium’s existing modified bitumen roof reached the end of its service life, the decision was made to restore it with Garland’s Energizer K Plus FR. “We used Garland’s Energizer system, a cold-applied system with polyester mesh and granule surfacing on it,” Looney notes. The roof was restored with Garland’s Energizer K Plus FR system, a cold-applied roofing restoration system with granular surfacing. Photo: The Garland Company Inc. Some perimeter areas of the roof were removed and repaired after an infrared scan was used to detect any moisture, and then the entire roof surface was cleaned and primed. The fluid-applied system is installed in two coats with a polyester or fiberglass scrim sheet fully adhered into it. Immediately after the second coat, granules are broadcast over the entire surface. “The finished product is very good-looking,” says Looney. Work on the vertical surfaces began in September 2018. The complex features walls clad in an exterior insulation and finish system (EIFS), as well as concrete and concrete masonry unit (CMU) walls. “The EIFS, concrete, and CMU walls each required a different application, but the basic scope of work is the same for each, with some variations,” Looney says. Wall Coating: Tuff-Coat, The Garland Company Inc.
Joint Sealant: Green-Lock Sealant XL, The Garland Company Inc.